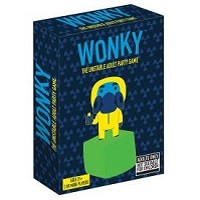 Wonky, the unstable adult party game is not to be confused with its twin look alike (a game by the same name and same concept) is intended for adults due to the nature of the cards and the intent of playing the game. Players will need to stack blocks and be aware of the strange side effects that may or may no happen. The pressure of stacking something is a game can be entertaining but then mix in different challenges from the cards and in this case, side effects, and you have a really fun game. If you've ever played this adult version of Wonky, let us know what you think below. We also have the free official Wonky game rules and instructions so you can refresh on exactly how to play. If you're out to win you'll need to be the first player to play all of your protocol cards or stack the 9th element cube. Included are 9 custom wonky cubes, 54 protocol cards, 20 side effect cards and the official Wonky game rules and instructions. Please keep in mind that the official Wonky party rules and instructions could be different depending on the game version you have. The rules below are some of the exact directions on how to play Wonky. Share with us your comments, funny stories, tips, advice, strategies, creative ways to play, questions about how to play, problems with the rules or anything you want about Wonky. All submissions will be reviewed within 24 hours. Click here to add your Wonky comments.